So here you are, your business is taking off and you know you just need a little bit of working capital to buy some inventory and grow your company. Not so fast! While banks are a great place to get an SBA loan, they often don’t understand the details that come with an online business and therefore usually turn away many online merchants from loans. That’s where PayPal working capital comes into play, in theory they should be a great resource for you to try and get that financing you need, but sometimes even they will deny you that money you and your business need to get to the next level. 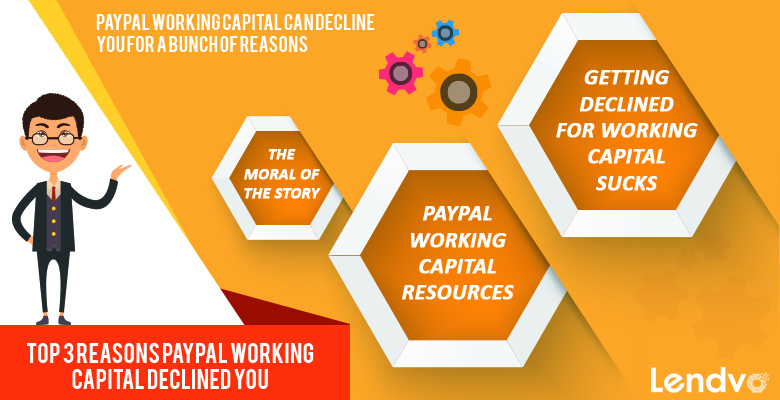 We did a bunch of research to try and figure out why this is the case, after all we (Lendvo) are in the business of making loans to online businesses too and here are the most common reasons we find that people were declined from PayPal working capital. Just like any automatic algorithm, it doesn’t get everything right. Maybe your business is good, but the PayPal computers crunch the numbers and they just can’t get over something and since they are dealing with so many people they just don’t have the time to manually check and see how they can help. That’s why sometimes a company like ours is able to make you a financing offer even when you’ve been declined by PayPal because we look past the algorithms and automatic decisions and look at you, the business owner and see what could work. Sometimes just having a phone call can clear it all up, but that isn’t always an option with mega sized companies like PayPal. We all have big dreams, but sometimes the reality of the situation is that the numbers just don’t work. If your sales are too low in comparison to the money you are requesting it might be hard for PayPal to make you an offer when they know it will take them a very long time to get paid back. Of course, it’s like a catch 22 because you need more money to boost your business to get to the next level where you can make more money. That’s why it pays to check with us, we might be able to make you a loan based on the value of your domain name and not just your current sales. But if your sales are zero, well zero is zero. So just like anything else, PayPal doesn’t want to see that everything you sell get’s returned or more realistically that there is a high rate of this happening. It signals to the decision computers that people may not continue to buy your product and this will put you in a position where you may not be able to repay the working capital loan that you took. Always try and work things out with your customers, and more importantly learn why they are dissatisfied and make improvements. Sometimes at Lendvo we see great businesses that have tunnel vision and don’t see there own problems. We can help by pointing them out and maybe even making a loan once we know you will implement the necessary changes. If you need working capital to take your business to the next level our best advice is DON’T GIVE UP! Keep working on your business, put in the time and effort and grow your sales customer by customer. Over time hard work pays off and you might qualify for financing sooner than you think. Obviously give us a shout too and there might be something you can help with.